You know what? If eating healthy tastes this good, then goodbye cheese! (Kidding, kidding. I shouldn’t even joke about such things.) 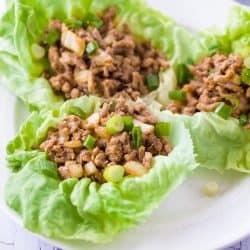 But I will say, these chicken lettuce wraps are amaze-balls, why did it take me so long to try these?! And I’m sorry, the fact that they are ready in twenty minutes?! Insanity! What blew my mind even further, was my toddler loved this filling. Absolutely loved it. I gave her a taste and expected her face to scrunch up, but nope. Happy as a clam. I had this stupid grin on my face as I scooped a hearty portion on her plate and watched her sit there and eat it. She’s not a picky eater necessarily but I figured these Asian flavors might be an acquired taste for an 18 month old. Well not this girl! Bahaha. Bottom line, this one was a total win for my husband, my toddler, and myself. I’m sure our dog Toby would also report this recipe as a success if he could. I’m sure I dropped some on the floor at some point, and I’m sure he was there to eat it right up. Stir in the garlic, onions, hoisin sauce, soy sauce, rice wine vinegar, ginger, sesame oil, sugar, and Sriracha. Stir occasionally and cook until onions are soft and translucent, about 2 minutes. Stir in the chestnuts and sliced green onions, salt and pepper and heat for an additional minute. 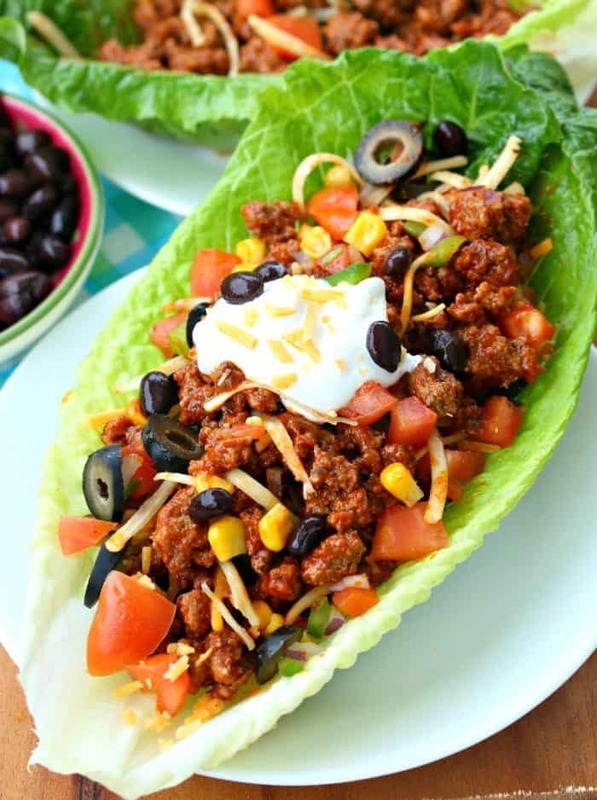 Spoon 3-4 Tablespoons into the center of each lettuce leaf and enjoy! If you don’t have (or like) ginger, sesame oil, Sriracha or chestnuts, this recipe is still delicious without them! 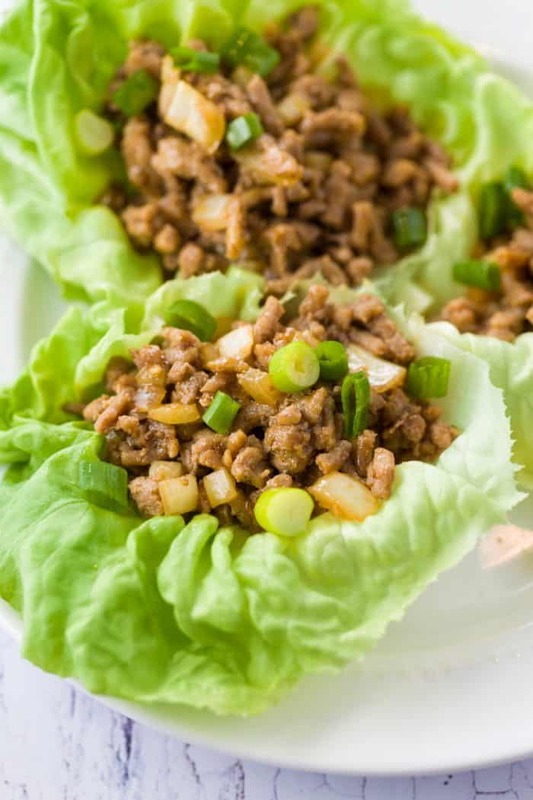 Ground turkey is a great option in this recipe as well. Amazing! My husband loved this one! He prefers spicy so I increased sriracha. Will definitely make again. Hi Tina! I’m so happy that you enjoyed it as much as we did, I love extra spice too, good call! Thanks for letting me know how it came out! It is extremely delicious. We had this at Pf Changs and was so good so was excited when I saw this recipe. That’s awesome Janice! I’m so happy to hear it, thank you for sharing!!!! This came out just like PF Chang’s great! My husband and I loved it! A healthy, easy, and delicious recipe! Will definitely enter our weekday rotation. Thanks!! Wahooooo!!! We felt the same way, thank you so much for taking the time to comment and rate- you’re the best! I have been on a pizza kick for awhile now and am always looking for creative new pies. I made this and put it on a Boboli Pizza Cruist and it is absolutely amazing! Best pizza I have ever had! I added a light layer of Italian 5-blend shredded cheese. No need for sauce, and, of course, you omit the lettuce! Hi Tom! WOW!!!! I never would have thought of putting this chicken on a pizza, it sounds delicious now that you say ! I am definitely going to have to try that, thank you for sharing! Happy Cinco De Mayo, have a great weekend! Hi Connie!! Yaaayy! I’m so happy that you enjoyed this recipe and found it easy to follow! That’s my goal! I’ve had to omit sriracha a time or two for various wimps as well so I hear you there, haha!! —LOVE that you had fresh garden lettuce too! Nothing beats that! My husband has never been to PF Chang’s and had never had these. I was so excited when I saw your post about this on Instagram and told him I was going to make them. He was super skeptical when we went to get the rice wine vinegar and lettuce today, but is devouring them now. Thank you!! I used ground turkey since it is what I had already, but I will use chicken next time. Even our 6 y/o is happily eating them!! Hi Lisa! I had to laugh when I read this, it’s as if I wrote this comment myself! 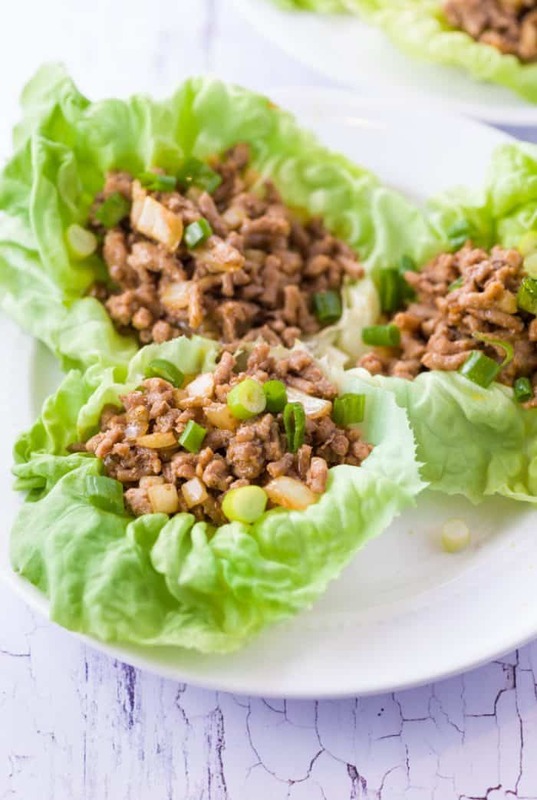 I used ground turkey at first too, my husband was super skeptical and loved them, AND my toddler loved the filling! Hahaha so funny! I’m so happy you had the same experience! !